Colorado is the gateway to the West with direct flights from the UK to Denver served by British Airways and indirect flights by Icelandair. From 16 September, Norwegian will introduce direct flights to Denver from Gatwick, with a twice-weekly service, while Denver is also a major hub for United Airlines, which is launching a daily non-stop seasonal service from Heathrow from 24 March – 26 October next year. Wintersports may be big here but Colorado's adventures throughout summer deliver an adrenaline rush for all ages too – from canyons to coasters. Here are some of the highlights. Thrill seekers can live life on the “ledge” by setting up camp on the side of a mountain. Kent Mountain Adventure Centre guides outdoor enthusiasts through Estes Park with a selection of adventures, from a “cliffnic” lunch on a ledge set up 50ft from the ground to rappelling down a cliff face with just a sleeping bag for an overnight on a vertical wall. Prices are from $1,600 for two people overnight or $860 for a group of four for cliff picnics. The “Gear Garage” service at Denver's newly opened Halcyon Hotel in Cherry Creek is filled with a selection of hand-picked gadgets and kits specially put together for a range of outdoor thrills. Visitors can ride into downtown Denver on a Vespa, rent a cruiser bike or e-bike to explore the city's 85 miles of paved bike trails, or skate through the Cherry Creek district on a Halcyon longboard. Adventure packs, comprising a rucksack, outdoor camera, binoculars and refreshments, are fully stocked for a picnic in the sun or for hiking up one of Colorado's 58 “fourteeners” – mountains with an elevation of at least 14,000ft. New for summer 2017, Snowmass has brought in more bike trails adding to the 80-plus miles of terrain accessible from Snowmass Village. Routes include the Seven Star Trail – an advanced four-mile dirt track which snakes along the hillside to Brush Creek and into town. Breckenridge has launched an on-mountain summer activity programme called Epic Discovery, with 13 activities for the family. Available daily until 10 September, the family-focused adventures include interactive exploration zones, an Ariel Adventure Tour, a climbing wall, tubing down a river, ziplines and more. Breckenridge is the latest of Vail Resorts' ski destinations to introduce the selection of summer adventures, with an all-day Adventure Pass costing $82 for adults and $40 for children. New for summer 2017, the Haunted Mine Drop at the Glenwood Caverns Adventure Park will leave guests breathless as they drop some 100ft on the first ride of its kind in the world that descends inside a mountain. The park is the only mountain-top theme park in the US with thrills for the whole family, from exploring caves to being launched over Glenwood Canyon on an exhilarating Giant Canyon Swing. Ouray is known for its ice climbing in the winter, but during the summer months the same rocks and waterfalls can be explored by canyoning. It entails repelling down waterfalls and exploring river canyons, with the Canyoning Colorado company offering new guided descents with training for all abilities. The cost is from $89 for a half-day course and from $169 for a full day. Steamboat is set to welcome the Outlaw Mountain Coaster opening this month, the longest ride of its kind in North America. The gravity-driven bobsled carts will descend more than 400 vertical feet down a mountain track with a total riding length of more than 6,280ft. Single ride tickets are $20 with additional rides available to buy on-site at $15. 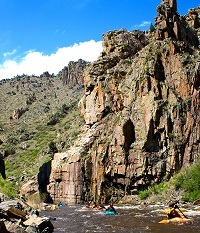 Colorado's only nationally designated Wild and Scenic River, the Cache la Poudre, carves down Poudre Canyon through narrow sections flanked by alpine mountains and natural rock cliffs west of Fort Collins. The thrill of paddling over a rapid named Devil's Staircase is second only to the views and the chance to spot bighorn sheep and deer along its rocky hills. Rafting guides lead groups through rapids of all difficulty levels based on experience, so everyone gets just the right amount of adventure. The Royal Rush Skycoaster sends adrenaline seekers free-falling over the Royal Gorge Canyon at speeds of up to 50mph to dangle 1,200ft above the Arkansas River. 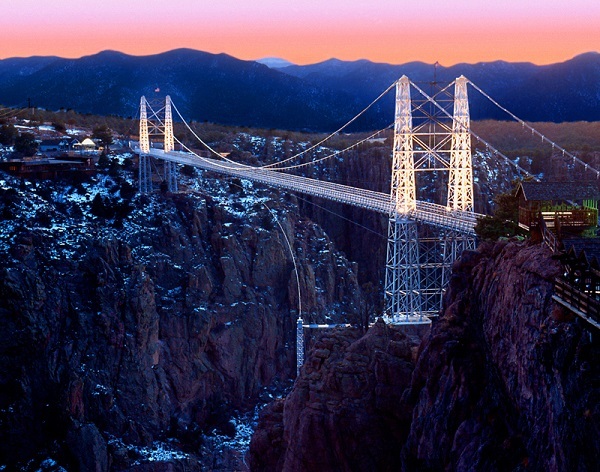 The thrill is heightened with views of the 1,000ft red-granite walls of the canyon and the Royal Gorge Bridge, the highest suspension bridge in the US. The canyon and panoramic views can also be experienced by aerial gondola, zipline and at photography lookout points. Outerbike, billed as the biggest mountain bike demo event on earth, comes to the Rocky Mountains for the first time from 18 – 20 August, showcasing Crested Butte and the Gunnison Valley's 750 miles of mountain bike trails. Visitors can trial as many of the latest and greatest bikes as possible or bring their own bike and enjoy the trails.